Hiller, Ruth and Sergeiy Sandler, "A Matter of Conscience: Militarism and Conscientious Objection in Israel", in: Murray Polner and Stefan Merken (eds. ), Peace, Justice, and Jews: Reclaiming Our Tradition, New York and Charlottetown: Bunim & Bannigan, 2007, pp. 207-214. The basic assumption underlying everything that is presented in this chapter is that conflicts between human beings can and should be resolved peacefully, and that the Israeli-Palestinian conflict is no exception to this general rule. War, atrocities and brutal oppression may serve many powerful interests, but not a single genuine need. There are, always, good alternatives to violence and injustice, but people are often brought up not to see them. The subject-matter of our chapter is the question of conscience and of conscientious objection to military service, and we would like to ask this question in the context of our own experience as Israeli Jews. It is fitting to inquire on the role of Jews in times of war and bloodshed. This question is relevant to the participation of Israeli Jews in the Israeli armed forces and the continued occupation of Palestinian territories (OT – Occupied Territories), just as it is relevant to other Israeli citizens, indirectly involved in the war effort, just as it is relevant to Jews in the Diaspora, actively or passively supporting this war and others. This was the question that several female activists asked in the summer of 1998. They were all members of a self generated and self facilitated study group that had formed a year and half earlier. The study group focused on feminism, militarism and the effects of militarism on society. Curious to learn more regarding draft resistance on grounds of conscience and the consequences of refusal they decided to hold a study day (teach-in) that would allow for exploring collectively the place and limitations of conscience and conscientious objection within Israeli society. They decided to explore the myth of Israel having a “people’s army”, to ask who does enlist, who cannot and who chooses not to. The study day, titled “Aspects of Refusal in Israel”, was held in October 1998 and attended by over 150 participants. It led to the formation of the New Profile movement. “Our name, New Profile, reflects the long-range aim of our organization: to change the Profile of Israeli society from a militarized society of war and might, to an actively peacemaking community in which the rights of all its citizens are protected and promoted equally, and the human rights of all people residing inside and outside Israeli borders are respected”. As two active members of the New Profile movement, we would like to address the issue of conscience in the Israeli society from the perspective of our movement’s work and social analysis. Israel is a country where national participation in the military is mandatory. In most parts of Israeli society, it is assumed that “everybody” enlists. But we also know this assumption does not reflect reality. There are Israelis who raise the question of whether serving in the army is compatible with the call of their conscience. The Israeli military’s actions in the OT and in Israel itself helped catalyze this process in the hearts of many. Some answered this question by deciding to openly refuse to serve in the military as a whole, while others limited their refusal to tasks being performed in the OT or to specific orders. Yet others decided to find other ways of avoiding military service, or particular forms of it. New Profile, together with other organizations such as Yesh Gvul, signatories of the two Seniors’ Letters, the Refusers’ Parents Forum and Courage to Refuse have successfully pealed away the myth of general recruitment and legitimized a public debate regarding draft resistance and refusal to serve in the military or in the OT. Since its founding, New Profile has worked intensely to raise awareness to the fact that conscientious objection and avoiding military service are a legitimate part of mainstream Israel. We continue to give support on a very wide level to all draft resisters and objectors, male and female, whether they resist service in an occupying force, are pacifists or chose not to serve in the army for economic or other reasons. We also understand the importance of offering their families emotional support. In Israel, conscientious objection should be considered in a broader aspect than what the usual connotation of this term might suggest. A conscientious objector spending time in prison for her or his refusal to serve in the military boldly confronts the law, public opinion and the military system. But a young person who quietly arranges to get a medical discharge from military service might be doing something no less courageous and no less conscientious. To understand why this is so, we should take into account the enormous pressure the Israeli society puts on every young person in the relevant parts of the population, to enlist. On the more formal level, there is an official high school curriculum of “preparation to military service”, jointly run by the Israeli Ministry of Education and the Education and Youth Corps of the military. This program comprises several curricular subjects (such as physical education, home room teacher hours, some of the geography lessons), specifies the content of several school trips and includes, in addition, special classes taught by a soldier in uniform (regularly present in school) and an optional (but “strongly recommended”) component of a military training camp, complete with real military uniforms and weapons training. In its present incarnation, this curriculum also sets an “adopting unit” in the army for every high school in Israel, and the commander of this unit (an officer ranked Lt. Col. or above) is scheduled for a series of lectures in the “adopted” school (see Shalev, 14 Jan. 2005). But this is really only the tip of an iceberg. The military is present in the Israeli formal educational system, inside many families, and in the culture in general, on many levels. The militarization of kindergarten education can serve as a good case to demonstrate our point here. 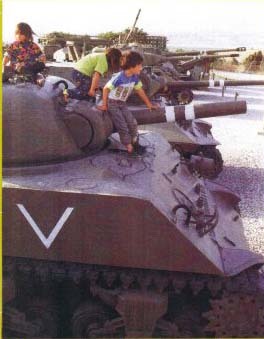 The fact that in some kindergartens in Israel children mark the end of the year by performing a mock military parade was considered odd enough by some, to have made it into a minor critical press item once (Lavie, 28 June 2002). A more common practice is holding a ceremony with the children, which honors soldiers and military units. Such ceremonies are often organized by municipalities, and held around the time of Independence Day. The soldiers are present at the ceremony. All the kindergarten pupils in town are transported to a public ground to bring presents for the soldiers. The commanding officer of the guest military unit often gives a short speech at the ceremony, thanking the children, their parents and the teaching staff, while (in one case we have recorded) noting what a great human potential are the children for the future of the army. These events are so common that they are not considered newsworthy, other than as part of the municipality’s public relations work. In some such ceremonies genuine tanks and other military equipment may be brought to the ceremony for all the children to climb on and play with. In addition, it should be noted that there’s quite an assortment of real weaponry (tanks, cannons, battle planes, etc.) permanently placed in public spaces in Israel for the purpose of creating national monuments, or just for aesthetic considerations (Givol, Rotem and Sandler, 2004). The soldier image is ubiquitous in Israel. It appears in, e.g. commercial ads, children’s literature, school curricula, the naming of streets, etc. New Profile has long made a practice of identifying the use of this image in the cultural sphere, and of shedding from it the cloak of normalization, hiding it from the attention of most Israelis. In 2001 New Profile activists collected quite a few of these images and created a roving exhibition: “Study War No More”. Some images depicted in the exhibit show how the soldier/hero image is used to sell cheese, cell-phones, beer, and even tranquilizers for an anxious mother of a soldier son. But the overt presence of the military is only one part of the story. Referring back to education, a main component of the educational process in Israel, grades K-12, centers on the Jewish holidays. There is a pattern within the narrative: we, the Jews, fought against evil others. These others shift depending on the holiday: Greeks in Hanukkah, Persians in Purim, Egyptians in Passover, Germans on the Holocaust Remembrance Day, “The Arabs” on Memorial Day and Independence Day. We won. History curricula, field trips and school ceremonies all work to instill the seeds of the belief that no alternative exists to the constant state of war. History lessons, and many aspects of the general public discourse as well, teach that “we” are always under attack, but “we” are mighty and persevere. This does not have to be so. Jewish education does not have to promote the belief in military might and in perpetual war. The rich Jewish traditions contain many alternative narratives that can be chosen from. The holidays also celebrate the pursuit of freedom, dignity and justice. Unfortunately, for the most part, Israeli educators choose to celebrate military might, fear and hatred toward non-Jews, and the belief that problems are to be solved by brute force. War culture is prevalent in the Israeli educational system. It normalizes war and military service. Our children are taught to see military service as a natural stage of development. As parents, Jewish citizens of Israel, we are taught to accept this under the pretext of having no other choice, personal or national. However, we are also witness to the fact that our children, despite the militarized education they receive, are opting today more than ever to abstain from, or object to military service. Israeli youths are required by law to start a pre-registration/enlistment process at the age of 16. This is often the time when they begin to examine the option not to enlist. They are not always able to identify a single reason why they feel that being part of a military is not right for them. They are confronted with questions of morality and questions about their future as individuals. This questioning may eventually lead to the development of a more cohesive political outlook. The act of refusing to perform military service touches on a special sensibility in Israel, and it is hardly surprising that acts of refusal have had outstanding political impact. The phenomenon of declared conscientious objection has been with us since before the State of Israel was established. When in 1944, young pacifist David Engel openly refused to volunteer into either the British army or one of the Jewish paramilitary organizations in Palestine, this involved him in an angry personal correspondence with future Prime Minister Moshe Shertok Other conscientious objectors have continued to make big news occasionally, as was in the case of Amnon Zichroni in 1954, or of Giora Neumann in the early 1970s (Blatt, Davis and Kleinbaum, 1975). Such high-profile cases of refusal often helped to highlight important political issues, especially those pertaining to the 1967 occupation of the OT. In the early 1980s declared conscientious objection became a more widespread phenomenon in Israel, mainly because of the new type of refusal introduced by several individuals and represented by the Yesh Gvul movement: reserves soldiers refused to be posted beyond Israel’s recognized border. This movement has already reached many hundreds in size, with 168 people behind bars in the early years of the Lebanon War (1982-4). This phenomenon was later on cited by some political leaders as one of the motives for Israel’s partial withdrawal from Lebanon in 1985 (Kidron, 2004). The second Intifada in late 2000 brought with it a significant new stage in the development of the refusal movement, and of its impact. Throughout the first year of this Intifada, the Israeli mainstream media and public discourse kept total loyalty to the official perspective on the conflict. Apart from the generally skewed reporting of events (see Dor, 2004), there was also almost no media representation of the numerous activities by Israeli left-wing movements to counter Israel’s offensive on the Palestinians, to bring out the truth about the war crimes being perpetrated by Israel’s army and to promote Israeli-Palestinian solidarity. This has changed drastically on 2 Sept. 2001, when 62 high-school pupils published a collective declaration, announcing their refusal to serve in the Israeli army (totally or selectively). The “High School Seniors’ Letter” became the main item in the Israeli media for several days. This refusal movement became the one avenue through which the Israeli peace movement at large gained access to public discourse. This story repeated itself in many ways, when in January 2002, a group of 52 reserves combatants declared selective refusal and formed a new movement: Courage to Refuse. Their work has gained extensive media and public attention. The declared refusal movement continued to grow on all parameters. Firstly, both these collective refusal declarations outgrew the number of initial signatories by far. Together with individual objectors, we estimate that more than 2000 people declared conscientious objection of one kind or another since 2000 in Israel. Secondly, some forms of refusal have spread further into the military establishment itself, with members of two elite military units (members of the General Staff Commando Unit and fighter pilots) issuing collective declarations of refusal in 2003. These declarations were later cited as part of the motivation for the Gaza withdrawal of 2005. The public and cultural impact of conscientious objection has grown as well. In 2003/4 a group of six conscientious objectors stood trial before a military tribunal for refusing to enlist. This year-long event had not only generated significant public interest, but it has also yielded a book documenting the trials (Khenin, Sphard and Rotbard, 2004), a theatrical re-enactment of one of them, and even a regular column in one of Israel’s leading news websites, written by one of the objectors from prison. The growing impact received by these high-profile objectors has also created an important discussion within the refusal movement about the place of other kinds of conscientious objection within it, especially that of women. It is important to note, although not often recognized, that most declared conscientious objectors in Israel in recent decades have been women. And yet, it was not until 2004, that the conscientious objection of a woman to military service generated considerable media attention. Women were also marginalized inside the refusal movement itself in many respects. In the past two years, declared conscientious objection has enabled bringing new issues to attention. Thus, Idan Halili, an objector who spent time in prison in 2005 (and was supported in a special campaign by New Profile), refused to serve in the military on feminist grounds, viewing the military as an inherently patriarchal institution. Her refusal succeeded in generating an impressive amount of public attention and media coverage. The movement of declared conscientious objection within the Druze community in Israel has existed for many years. Individual Druze objectors have declared their refusal to wage an ethnic war against what they perceive to be their own people, already in the late 1950’s, when the decision was made to conscript them. Since 1972, these objectors have joined forces to form the Druze Initiative Committee. Nevertheless, it wasn’t until quite recently that some cases of Druze objectors began to reach the major Israeli media outlets. Still, the refusal movement in many respects duplicates, in the image of the imprisoned conscientious objector, the militaristic notion of the heroic figure, suffering for the common good. From the perspective of the struggle against militarism in the Israeli society, not just against Israel’s particular policies emanating from this militarism, there is something self-defeating in this kind of struggle. Another refusal movement, however, also exists in Israel, and it has direct and crucial impact on all aspects of Israel’s military and social policy. This movement only gets a derisive mention in the mainstream media once in a while, when another celebrity is found out not to have served in the army, or when another report brings, always in a disguised, cloaked and misleading form, the statistics. While all citizens aged 18 are supposed to be subject to the draft, men for three years, women for two years, just about a half enlist, and most do not complete the full term of service. This movement is not a movement of social elites. Quite on the contrary, enlistment rates are the lowest in poorer areas, among immigrants and, of course, among women and minorities. But by the force of its sheer size, this movement of refusal weighs on the entire Israeli political system. Conscription itself, as a system of recruitment, but also as a system of social control, is crumbling. Various forms of repressing those who have not served in the army (a favorite pretext for discriminating against non-Jews and to a lesser degree – against women) become increasingly ineffective, as too many members of socially privileged groups have already opted out of the army to make wholesale discrimination viable. The “no choice” narrative leads many Israelis, especially of the older generation, to perceive this situation as a threat. Efforts to encourage enlistment among the youth are thus motivated increasingly by panic. The militaristic nature of these efforts becomes more conspicuous, even to ordinary Israelis. All this makes these efforts largely counter-productive. The refusal movement – both declared and undeclared – is a powerful trend in the Israeli society today, opposing the dominant militaristic ideology, power structure and policies. For us in New Profile, supporting this movement is a task of paramount importance. We answer hundreds of requests for information and counsel from declared and ‘grey’ objectors every month. We provide them with legal aid when necessary, and always with emotional support. Even so, for many young Israelis, the militarized environment in which we live, and the never-ending pressure to enlist, make it difficult to even go seeking for assistance. This pressure to enlist, this social attitude, viewing military service as a natural and unquestionable stage in life, forces many young Israelis into deep inner conflict and distress. Indeed, for some years now, despite the fact that there is an armed conflict going on, the number one cause of death among Israeli soldiers has been suicide (Rappaport, 18 June 2005). The question of conscience has much to do with this, as can be seen in the case of Rotem Shapira, a young Israeli pacifist, who enlisted into the army and has committed suicide after finishing his basic training in 2000 (see his biography: Algazy, 2006). Much of our efforts focus on the educational system, and on finding alternatives to the contents it teaches, especially regarding the roles it takes in dealing with sexism and the militarization of society. This is part of our work to demilitarize Israeli society, to counter militarism at the base, but it is also an attempt to reach out to those who need our help. Not surprisingly, we are usually barred from entering the public school system with our message, but there is also much to be done by way of informal education. We should here mention New Profile’s youth groups – groups of adolescents and young adults that meet regularly in various parts of Israel, creating a stage for open discussion on issues that have to do with militarism, war and enlistment. Our aim is to allow young Israelis to form their own position on these matters, at least partly and locally liberated from the great pressure to enlist, at least on some occasion free to question the fundamental narratives they received in this militarized society. Perhaps one day everyone will be able to enjoy this basic right. The question of conscience and its parallels, in particular with regards to Judaism, Zionism and the right to conscience by young Jewish men and women will hopefully also create a new dialogue for Jews in the Diaspora. The discussion at hand and the moral questions it raises, is perhaps not entirely different than the one that young Jews in the Diaspora would involve themselves in when considering enlisting in the military in their own respective countries. It does, however, provide the reader with an opportunity to look at the conscription of young Jewish men and women in Israel and at the same time allows us to question the involvement of Jews in the Diaspora and their direct support in creating an ongoing state of war. This discussion on the right to conscience will hopefully allow for a greater awareness of this issue within the global Jewish community. It allows us to consider the direct involvement of Jews in the Diaspora and their communities in the future of Israel. It allows us to question the responsibility and the roles taken on by Jews in the Diaspora in enabling a constant state of war between Israel and her neighbors. While charity and Judaism go hand in hand, and while Jewish communities in the Diaspora stress support of Israel, particularly with money donations, perhaps now is the time to examine just where these donations go. Do they go to organizations and projects that promote civil society, or are they channeled into government projects that support military actions? Do they support the funding of an ongoing conflict in the region and do they contribute to loss of life, loss of livelihood, loss of mobility and loss of equality within Israel itself and within Palestine? Or do these donations support organizations of your choice in which you believe and whose causes you would like to advance? Now is also the time to examine the price that Israeli youth pay, the physical danger and emotional turmoil they are exposed to, that is paid for by Diaspora support, in the name of the preservation of a Jewish homeland. This is already a question that should be discussed by the Diaspora Jewry itself. Algazy, J. (2006), Ha-korban [The Victim], Haifa: Pardes. Blatt, M., Davis, U. and Kleinbaum, P. (Eds.) (1975), Dissent and Ideology in Israel: Resistance to the Draft 1948-1973, London: Ithaca Press. Dor, D. (2004), Intifada Hits the Headlines: How the Israeli press misreported the outbreak of the second Palestinian uprising, Bloomington, IN: Indiana University Press. Givol, A., Rotem, N. and Sandler, S. (2004), The New Profile Report on Child Recruitment in Israel, Tel-Aviv: New Profile. Available online. Gor, H. (Ed.) (2005), Militarism be-khinuch [Militarism in Education], Tel-Aviv: Babel. Greenberg, H., “De-aga betsahal: habanot mema'atot lehitgayes” [“Concern in the IDF: Few Girls Enlist”], Y-Net, 24 July 2005, . Harel, A., “Be-ma'arekhet habitahon nifradim mera'ayon tsva ha'am” [“The Defense Establishment Departs from the Idea of a People’s Army”], Haaretz, 30 July 2004. Khenin, D., Sphard, M. and Rotbard, S. (Eds.) (2004), Mishpatei ha-sarvanim [Trials of the Objectors], Tel-Aviv: Babel. Kidron, P. (Ed.) (2004), Refusenik! : Israel's Soldiers of Conscience, London: Zed Books. Rappaport, A. “Halalim Almonim” [“The unknown fallen”], Maariv, 18 June 2005. Available online. Shalev, M. “Manhig Hinukh Rashi” [“Chief Education Leader”], Yedioth Aharonoth, Musaf leShabat [Weekend Supplement], 14 Jan. 2005. English translation available online. Yehoshua, Y., “Rak 1 mi-5 oseh miluim” [“Only 1 in 5 Does Reserves Service”], Yedioth Aharonoth, 25 May 2005. Quoted from the New Profile Charter. For more information on these groups, you can visit their websites: Yesh Gvul, Seniors' Letter, Refusers' Parents Forum, and Courage to Refuse, respectively. This educational program, together with other forms of military presence in the school system and of military intervention in children’s lives, is presented and discussed in detail in The New Profile Report on Child Recruitment in Israel (Givol, Rotem and Sandler, 2004), also available on New Profile’s website. The images collected for the exhibition can be viewed online. These issues have been discussed thoroughly in the papers collected in Gor (2005). This book grew out of a conference called Militarism and Education: a Critical Perspective, which took place in Jerusalem and Tel-Aviv in 2001. This conference, initiated by New Profile, brought together academics and activists from Israel and other countries to critically examine the various forms of military presence in education and to seek and support alternatives to it. These objectors were tried by the same tribunal in two parallel procedures. One objector – Jonathan Ben-Artzi – was tried separately, as his refusal is based on pacifist beliefs, while the other five – Noam Bahat, Matan Kaminer, Adam Maor, Haggai Matar and Shimri Tzameret – cited the occupation of the OT as their main reason for refusing. Up to very recently, these figures were not revealed to the public. The little information that began reaching the press in the late 1990s was deliberately misrepresented (thus, the army would publish figures for “the enlistment rate”, which in fact referred to Jewish males only, without anywhere indicating that). It required thorough and diligent research on our part to document and calculate the actual enlistment rates and to integrate the disparate pieces of information that appeared in different sources into a complete picture. Information published in the last two years (e.g. Harel, 30 July 2004; Yehoshua, 20 May 2005; Greenberg, 24 July 2005) tends to be more detailed, and less misleading, though still not complete. The enlistment rate among Jewish men is still relatively high – 77% as of 2003. However, only 60% of Jewish men complete their 3-year term of military service. Among Jewish women, the enlistment rate in 2004 was 57.7%. No data has yet been published anywhere about the number of women who get a premature discharge after enlistment. If we look at the whole population, Jewish and non-Jewish, we will find an enlistment rate of 53%, with somewhere around 44% finishing their mandatory military service as prescribed by law. All these rates have been dropping steadily since the early 1990s. Only fragmentary data have been published for the reserves: some 18% of all Jewish men and a few hundred Jewish women have performed reserves service in 2004. In most cases, though, this service was almost nominal. The full month reserves service, which was standard for Jewish men up to some 15 years ago, is now performed by about 3-5% of them.